When is this guy going to stop making a fool of himself??? 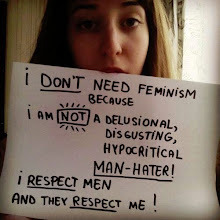 Yes people do shrug when a male claims to be a feminist like he does, as in "what a mangina". It's coming to a point now that people do shrug, followed by; "Ya, it's trudeau, what do you expect?" Did he just claim that women are so weak that they can't defend themselves if someone interrupts them and need to be protected? I thought equality meant they are as capable as men???? Specially when it comes to a debate??? Seems to me, he think women are not strong enough to keep up or stand up for themselves. That's his definition of feminism? Sounds to me that he has a battle of wits and nobody is home with his inner feminism, because he makes no frigging sense. Trudeau=an insult to strong capable women everywhere. Really, what a joke this "guy" has become.